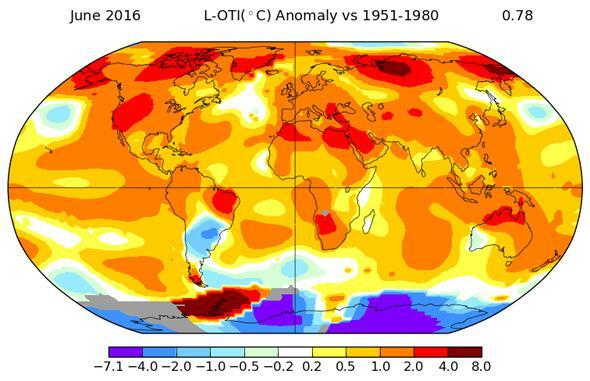 June 2016 was the hottest June on record. No human alive has seen a March April May June like this before. N.B. If this article sounds familiar, it should. This has been happening so frequently I just copied the post for March April May and updated it. October. November. December. January. February. March. April. May And now June. For the sixth seventh eighth ninth month in a row, we’ve had a month that has broken the global high temperature record**. According to NASA’s Goddard Institute for Space Studies, March April May June 2016 was the hottest March April May June on record, going back 136 years. It was a staggering 1.28°C 1.11°C 0.93°C 0.79°C above average across the planet. * The previous March April May June record, from 2010 2014 2015, was 0.92° 0.87° 0.86° 0.78° above average. The good news, such as it is, is that unlike previous months, June 2016 didn’t shatter the previous record; it just edged it out in a statistical photo finish. But don’t let that distract you from the important issue: The Earth is way above average in temperature, and overall that temperature is increasing all the time. Welcome to the new normal, and our new world. As you can see from the map above, much of this incredible heat spike is located in the extreme northern latitudes. That is not good; it’s this region that’s most fragile to heating. Temperatures soaring to 7° or more above normal means more ice melting, a longer melting season, loss of thinner ice, loss of longer-term ice, and most alarmingly the dumping of billions of tons of fresh water into the saltier ocean which can and will disrupt the Earth’s ability to move that heat around. Most likely there is a confluence of events going on to produce this huge spike in temperature—latent heat in the Pacific waters, wind patterns distributing it, and more. 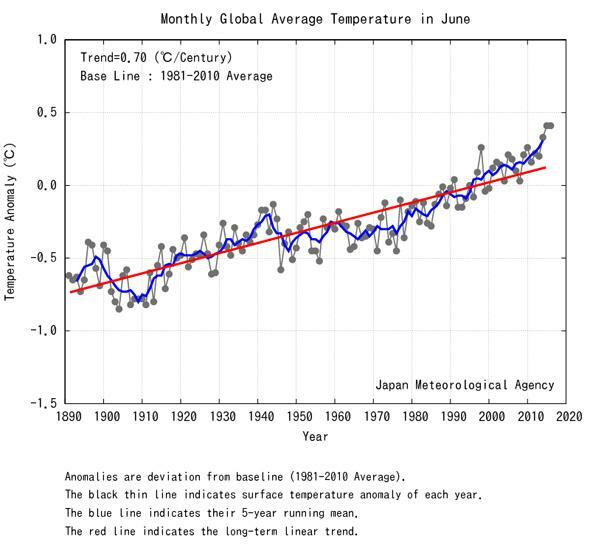 The Japanese Meteorological Agency measured similar temperatures as GISS (though it uses a different baseline for the average), and has June 2016 in a virtual tie for hottest June on record with 2015. Note the trend. See a “pause”? I don’t. And underlying it all, stoking the fire, is us. Humans. Climate scientists—experts who have devoted their lives to studying and understanding how this all works—agree to an extraordinary degree that humans are responsible for the heating of our planet. That’s why we’re seeing so many records lately; El Niño might produce a spike, but that spike is sitting on top of an upward trend, the physical manifestation of human induced global warming, driven mostly by our dumping 40 billion tons of carbon dioxide into the air every year. Until our politicians recognize that this is a threat, and a very serious one, things are unlikely to change much. And the way I see it, the only way to get our politicians to recognize that is to change the politicians we have in office. That’s a new world we need, and one I sincerely hope we make happen. ** Update, Oct. 26, 2016: After reanalysis, researchers at GISS lowered the June anomaly slightly, making June 2016 the third hottest June on record by a small margin. I give details in an Oct. 2016 post. I’ll note that the drop is very small, and the specific record isn’t scientifically as important as the temperature trend, which is still headed up. *GISS uses the temperatures from 1951–1980 to calculate the average. The Japanese Meteorological Agency uses 1981–2010, which gives different anomaly numbers, but the trend remains the same. Realistically, the range GISS uses is better; by 1981 global warming was already causing average temperatures to rise. † You may have noticed that the actual temperature anomaly for each month over March through June appears to be dropping; 1.28 to 1.11 to 0.93 to 0.79. That may be due to El Niño weakening, but it’s hard to know over such a short time period. Even if the trend continues, I’d bet 2016 will be the hottest year on record.